The J.W. 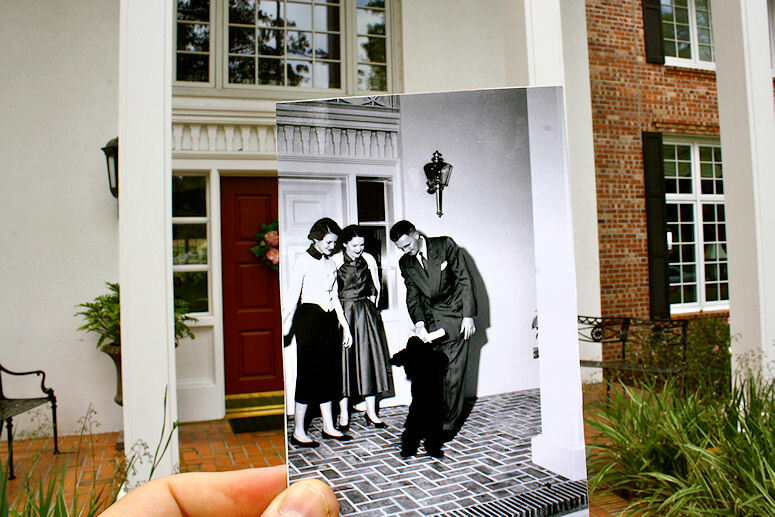 Reitz family stands on the front porch of the UF President's House on University Avenue in the 1950's. Dr. Reitz was the 5th president of the University of Florida, serving from 1955-1967. The president's house was completed in March of 1953 and one week later, President and Mrs. Hillis Miller (1947-1953), hosted more than 2,000 guests for the university’s centennial celebration. The house now serves as an Alumni building and is used to host special UF sponsored events. The caption of this 1950's photo states, "Parking problem for student - no space". 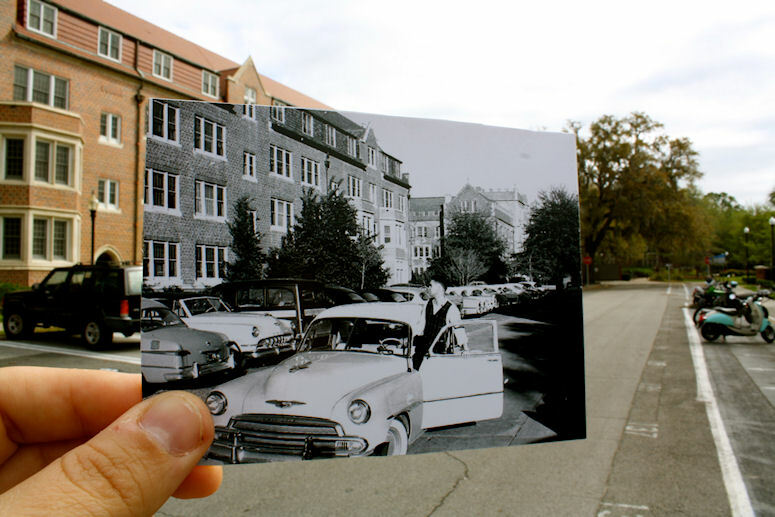 Sixty years later, faculty, staff and students are still looking for parking spaces. 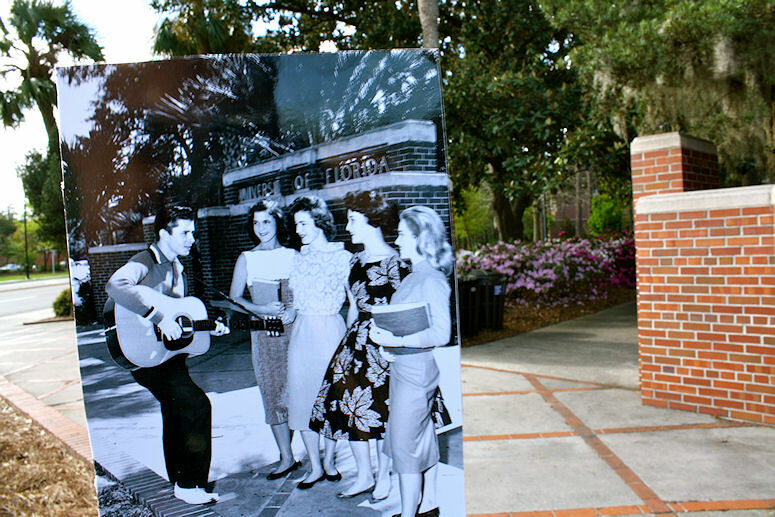 A student (Tillotson) plays his guitar for four coeds, 1950's. 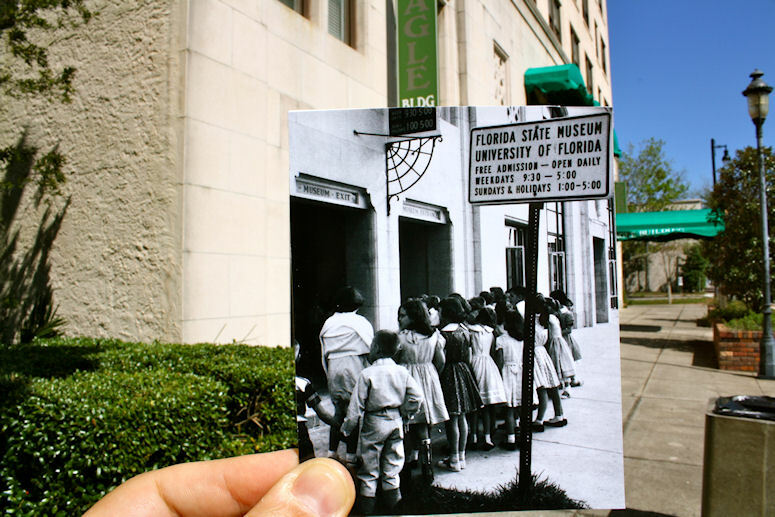 Young children stand in line outside the entrance to the Florida State Museum in the 1940's. The Florida State Museum (now the Florida Museum of Natural History) got its start in 1891 when Frank Pickel, a professor of natural science at Florida Agriculture College in Lake City, purchased research collections of minerals, fossils and human anatomy models as aids in teaching biology and agricultural sciences. The initial collections grew steadily with donations from other professors. By the early 1930s the museum had acquired nearly half a million specimens and in 1939 opened to the public in the Seagle Building located in downtown Gainesville where they remained for more than 30 years. The Seagle Building, now a residential and commercial property, went through a major renovation in 1983. Much of the building’s exterior, like the two openings seen in the photo, remain unchanged. 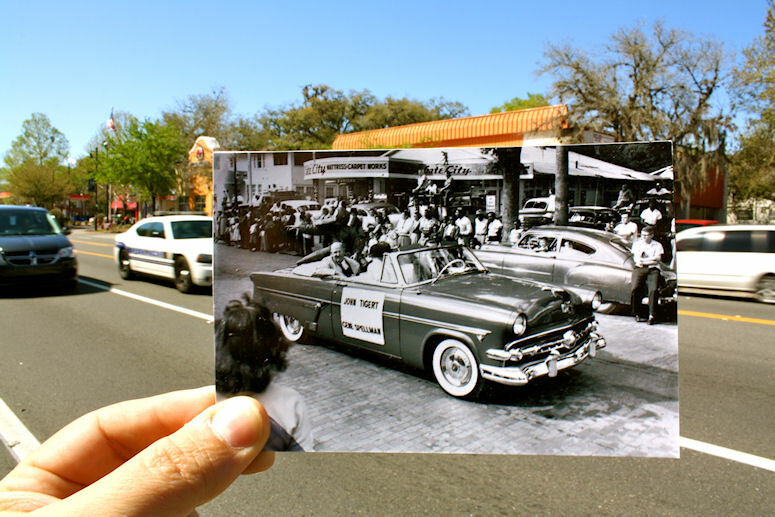 Car pulls a small float in the 1961 Homecoming parade. The “Florida Book Store” closed in 2016 after 83 years. 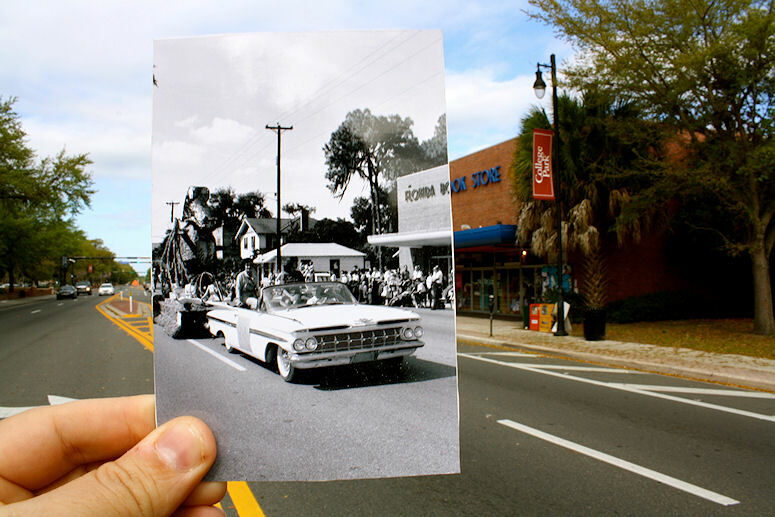 The 1958 Homecoming Parade travels past the Florida National Bank. The Fremac's building is no longer there. The old Florida National Bank building is now the office of Bill Cervone, Florida State Attorney for the 8th Judicial Circuit. 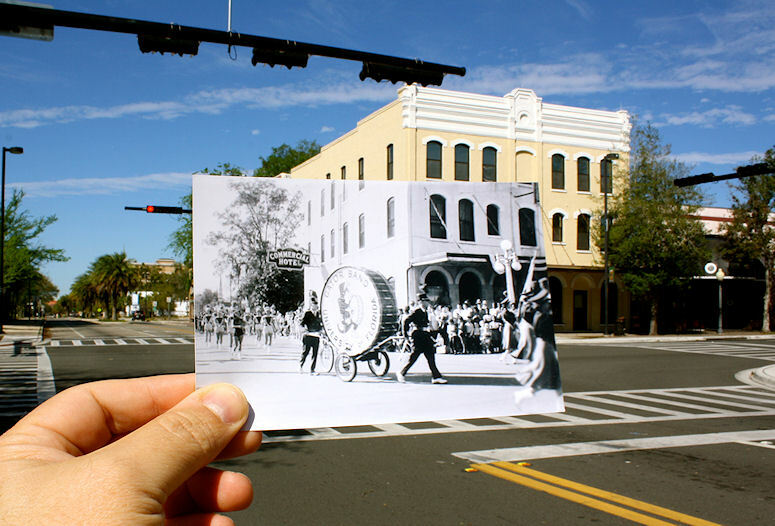 The Gator band, with the big bass drum, marches around the old Commercial Hotel in the UF Homecoming Parade of 1956. The Commercial Hotel (1887), on 120 South Main Street, was originally called the Alachua Hotel, and became the Commercial Hotel in 1924. The circular shape on the top and front of the building still has the letters CH. Vacant for many years, it was remodeled in 1973 as a county office building. 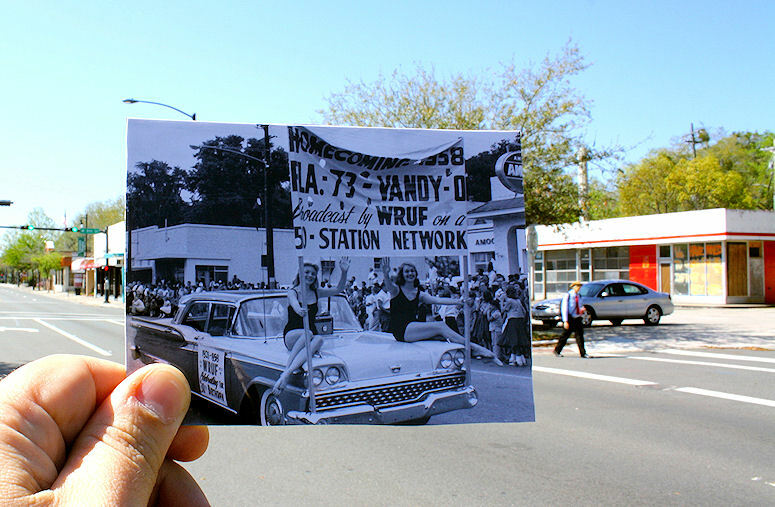 UF Homecoming Parade 1958. The Amoco station is no longer there, but the building in the background still exists. 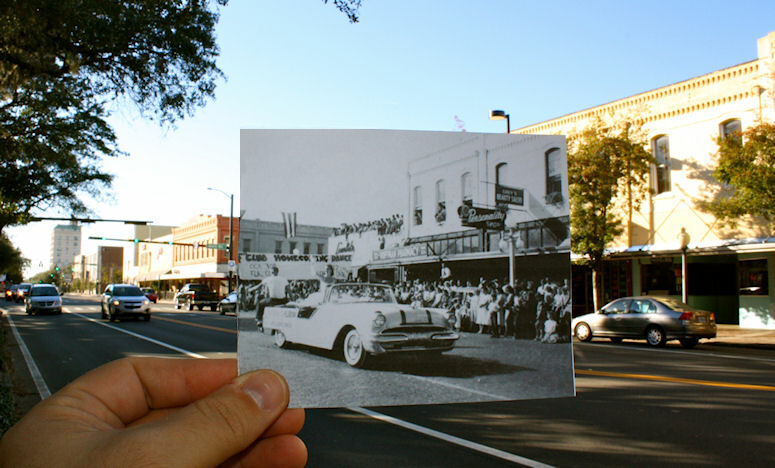 The UF Homecoming Parade in 1954. Notice the old display signs, Grey's Beauty Salon and Personality Shop. 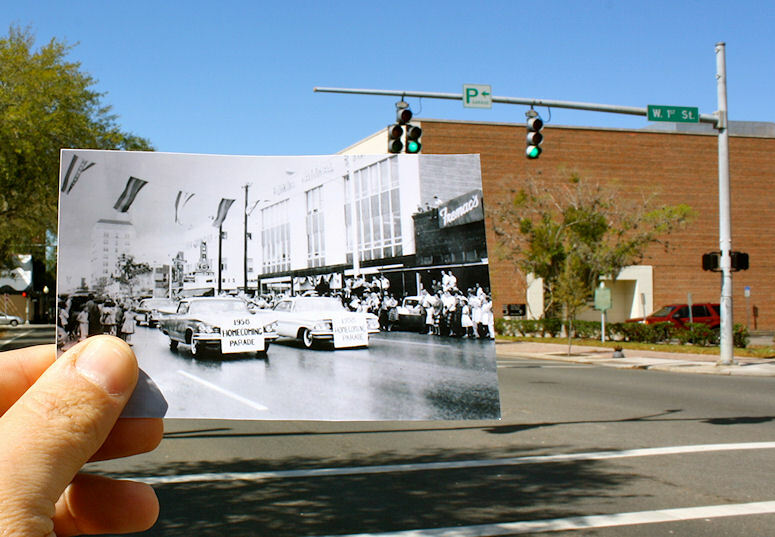 This part of University Avenue has not changed much with the photo connecting with the old Woolworth's building in the background. Majorettes in the 1954 UF Homecoming Parade march by Wilson's Department store on University Avenue. 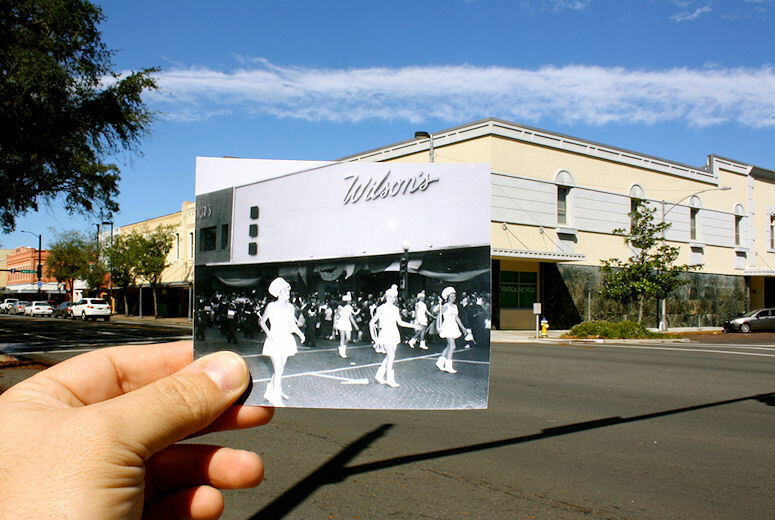 In 1966 Wilson's Department Store had been in Gainesville 92 years, having been opened by Henry Landon Phifer and his brothers. The original name was Phifer State Bank and Phifer Bros. Department Store. Visit Gainesville and the Alachua County Visitors & Convention Bureau now occupy part of the ground floor. Dr. John Tigert rides in the 1954 UF Homecoming Parade. The building in the background (with the orange roof) now occupies the space that was Gate City, Mattress & Carpet Works. Taco Bell, to the left, replaces the white house in the 1954 photo. Finding the location of the photo proved quite a challenge given the fact that none of the structures in the original photo exist any longer. A search of old city directories stored on microfilm at the library revealed Gate City’s address as 818 University Ave.
Men's hurdles relay race (year unknown) with Uster Hall in the background. Ustler hall was completed in 1919 and was originally named the University Gymnasium. It was the first UF structure intended for campus-wide use and from the 1920’s through the 1940’s, the multi-purpose facility was used as a basketball arena, assembly hall, chapel, dance hall, movie theater and lecture hall. 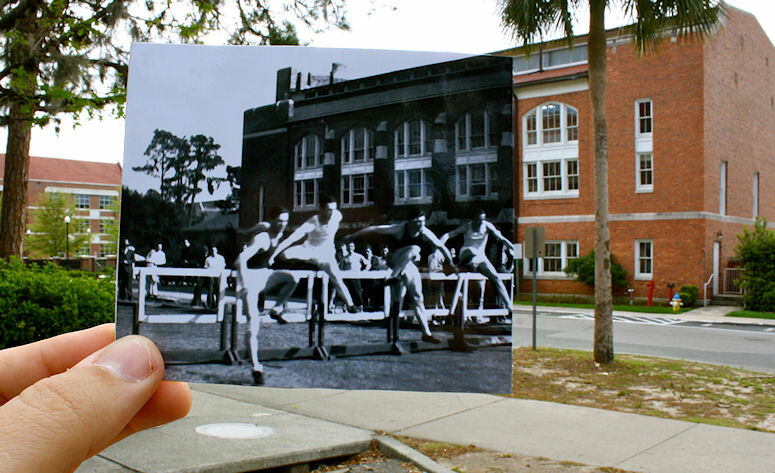 In 1948, when UF went co-ed, it became known as the Women’s Gym. In 1979, when the Women’s Athletic Department moved into the Florida Gymnasium, it was slated for demolition. Fortunately, it was granted protection under the National Register of Historic Places in 1988. In 2000, Kathryn Chicone Ustler funded the restoration and renovation of the building into a 14,700 square foot, three-level academic structure to house classrooms, meeting space and faculty and administrative offices for the Women’s Studies program, which took occupancy in 2006. It is the first academic building at UF named solely after a woman. 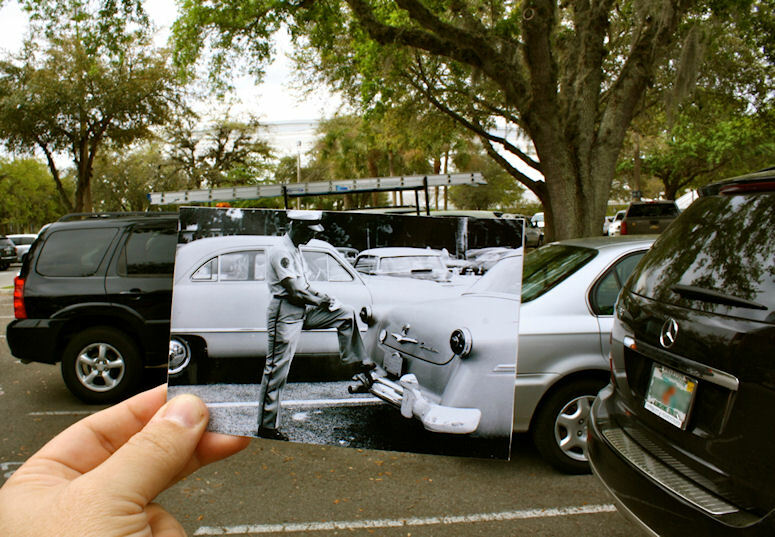 UF Police Officer writes a parking ticket in the 1950's. 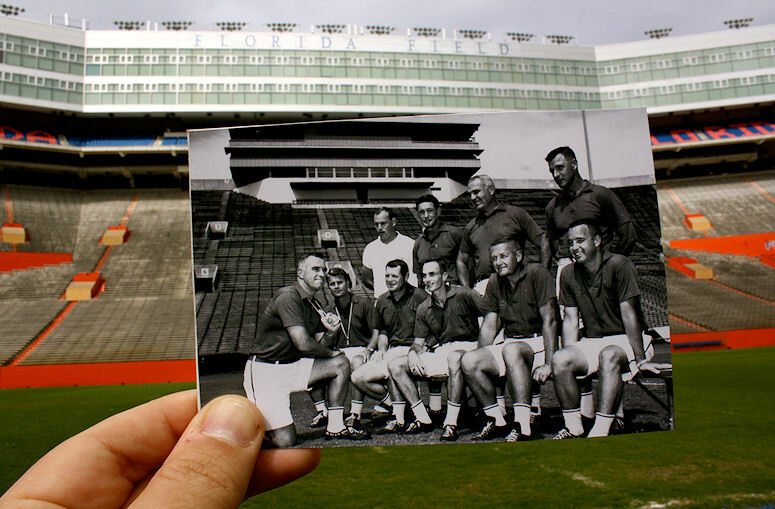 UF Coach Ray Graves and his staff in 1962.